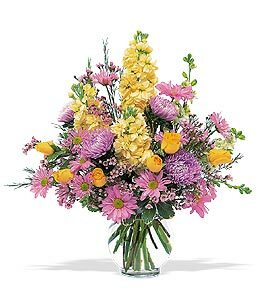 These perfect yellow and lavender flowers are so cheerful, they'll truly delight whomever receives them. So surprise someone special! Asters, daisies, larkspur, stock and roses arrive in a simple round bowl. Page loaded in 0.5158 seconds.